Rachelle Shafei attended an MS MasterClass last year, and when selecting her intermodule project, took the opportunity to tackle an unmet need both locally and nationally – the prevention of listeriosis in MS patients receiving alemtuzumab. The disease-modifying treatment (DMT) is one of several that people with multiple sclerosis can use to slow or even halt their disease activity, through impacting the immune system in a profound way. Alemtuzumab treatment induces extreme depletion of T-cells (one element of the immune system cell make-up which, in MS, attacks the body rather than the foreign bodies it is supposed to fight). However, this in turn leaves patients vulnerable to infection, particularly in the first month after treatment. Listeria infection is a particular concern because of manifests as meningitis and can be fatal. Mitigating against the risk of developing infections during alemtuzumab treatment is therefore essential, but there is no clear consensus on best practice for doing so, and each MS centre recommends different behaviours and treatments. ‘It is always best to take an evidence-based approach where all patients are helped to achieve the best possible outcome’, Rachelle states, and so she used her project to begin to address this variation in practice. The audit she conducted, which received Runner Up in the 2018 project awards, found widespread variation in patient knowledge and practice. Just over half read the information they were given at the start of treatment, but a quarter of these did not feel it was important enough to read in full. After treatment, more than half of patients who became ill in the time after treatment either delayed seeking help or chose not to seek medical attention at all. It was apparent to Rachelle that immediate action was needed. 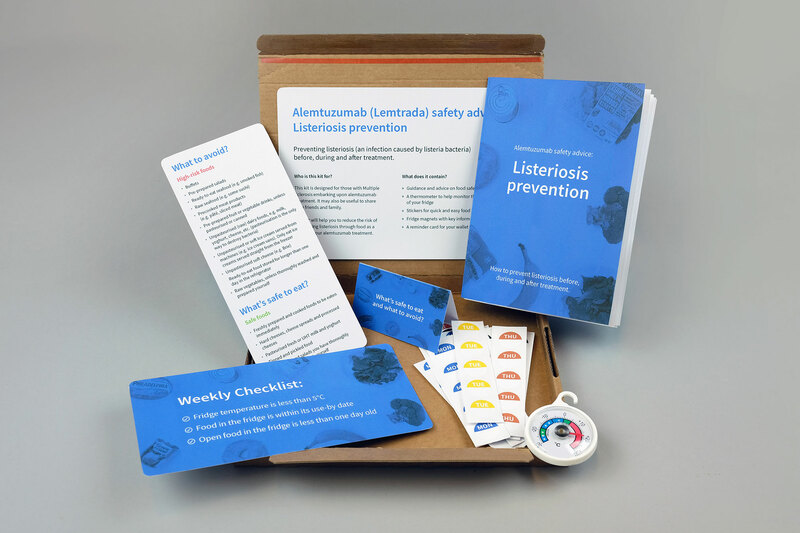 Looking for good practice to learn from outside of neurology led Rachelle to an epidemiologist in Cardiff, an expert in the prevention of listeriosis in the oncology sphere. Armed with this example, she spoke with local stakeholders to discuss a way to meet needs locally whilst also bringing a national benefit. The outcome was a website full of simple and concise educational content for patients and professionals to refer to on a national level, accompanied by a physical pack of practical resources such as a weekly checklist, food stickers for refrigerated items, and a fridge thermometer. The kit is being rolled out locally with deliveries to all local MS clinics, and can be ordered by other clinics via the website where anyone can access the clear, potentially life-saving advice online. Go to Rachelle’s website www.clinicspeak.com/listeriosis and share it with colleagues and patients as widely as possible. Read a short snapshot of Rachelle’s project or the full report here. Inspired to go on your own MasterClass journey? Find out more.